Adapted by Jason Neulander, artwork by David Hutchison, color by Lee Duhig. Available as a full-color trade paperback in our store. Coming soon to comiXology! This is the format in which The Intergalactic Nemesis got its start. Perfect for the car. Perfect for all ages. And the CD set includes beautiful full-color art by David Hutchison and Lee Duhig. 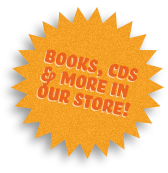 Find it in the store! 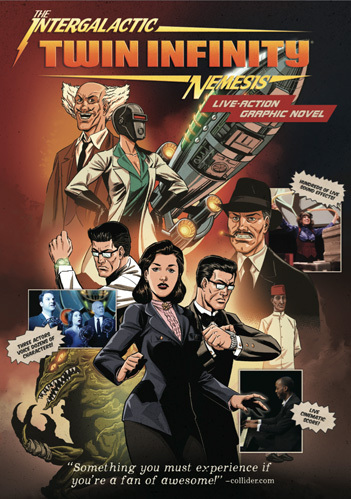 Live-Action Graphic Novel – see it in person! A mash-up of the audio drama and comic book. We take the comic-book artwork, remove the word balloons, and project it panel-by-panel on a huge screen while three actors voice all the characters, one Foley Artist creates hundreds of sound effects, and a pianist performs the cinematic score. Live! Check out the trailer to the left and see it live on tour! Coming soon to our YouTube channel, too! 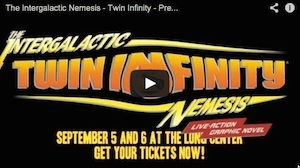 If you live in or are visiting Austin, Texas, then you don’t have far to go to see the entire Intergalactic trilogy. We’re playing all three shows at the Alamo Drafthouse Cinema, South Lamar until demand dries up (which we hope is never!). Click HERE for listings and details on our home-town shows. Hey, venues! We’re touring to more than 40 of you around the world this season, probably to you. We’ve made things easy for you in our Info for Venues section.